This is season for perfect games and no hitters. First Colorado's Ubaldo Jimenez threw a no-hitter, then Oakland's Dallas Braden threw a perfect game just 20 days ago. Philadelphia's Roy Halladay is the next to join the club as one of the best pitchers in the game today threw a perfect game against the Florida Marlins tonight in a 1-0 win. "I was just following Chooch (Carlos Ruiz)," Halladay said in his post-game interview on the local television station. Having covered this team this season, Halladay was probably telling the truth. Halladay is one of the most prepared baseball players in the game. He doesn't take the other four days while he is resting lightly. Halladay studies his next opponent and is very vocal during pitchers' meetings. What is the best Halladay card you have in your collection? Being a Halladay collector, it's tough choosing one as my favorite. I'm glad he pitched the perfect game... no one deserves it more than him. And it only beefs up his Hall-of-Fame resume. I can barely hang on to Halladays with the number of Halladay collectors. 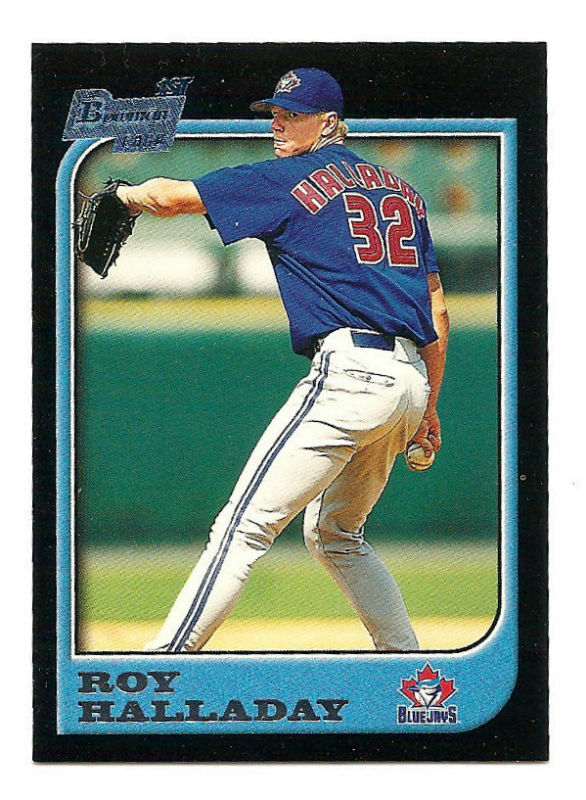 But I really like my 2009 O-Pee-Chee black border Halladay. Simple, yet effective. The best Halladay card I HAD in my collection, was from 2009 UD Icons, a jsy card numbered out of /25. I'm sure I could have sold it for a decent amount last night, had I not already moved it for FAR less then I could have gotten. Night Owl, I do like that card a lot. I was just looking at it on another blog. I think I've traded away all of my Roy Halladay cards. So, I'm not sure if I have any left.